Colletes hederae was recorded as new to Britain in 2001 when Ian Cross discovered specimens at Langton Matravers in Dorset. Since then, the bee has spread across much of southern England (as far north as Shropshire, Staffordshire & Norfolk) and into south Wales. It is now extremely plentiful in some coastal localities, and increasingly, inland. 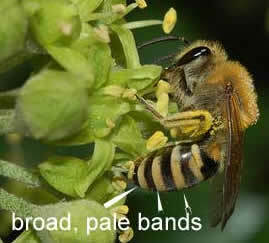 Peak activity matches the flowering period of its key pollen forage plant, Ivy (Hedera helix), and the species is on the wing from early September until early November. This makes it the last solitary bee species to emerge each year. BWARS has been mapping the spread since its discovery in Britain 15 years ago. Commonly asked questions concerning The Ivy Bee. This sheet provides advice for Beekeepers and Environmental Health Offiecrs who may get enquiries from the general public. Useful too, for completing Risk Assessments. Please submit records and photographs to Stuart Roberts at spmr[at]msn.com and include the words "Colletes hederae" in the message line. 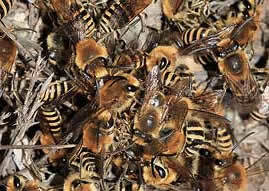 For a summary of the 2009, 2010 and 2011 Colletes hederae surveys please click on the relevant years. Anyone with large stands of flowering Ivy near them should look for this bee. Any largish Colletes visiting Ivy (often in large numbers) in October is likely to be this species. Also, you may notice large concentrations of this mining bee in soft, crumbly banks and cliffs. Males may be seen in frenzied mating clusters as they "mob" females emerging from their nests. So do check any suitable localities. Look for bees collecting pollen from ivy. It's fairly simple to determine Colletes hederae – it is a typical Colletes, but it can be as large as, or larger than a honeybee, and the banding on the abdomen of fresh specimens has a distinct orange hue. This fades in older specimens. Photos: Nico Vereecken and Jane Adams.